Cape Town is a popular cosmopolitan city in South Africa, renowned for its beautiful scenery, fantastic entertainment opportunities and luxurious accommodation. The city is a must-visit on any South African adventure, and makes for an excellent holiday destination for all types of travellers – especially those who enjoy the finer things in life. To celebrate this beautiful city, we compiled a list of 7 luxury hotels that boast the most beautiful surroundings and breathtaking views in Cape Town. Situated along the Victoria & Alfred Waterfront in a chic area of Cape Town, One & Only is a lavish hotel that overlooks the waterfront and has commanding views of Table Mountain, Devil’s Peak and Lion’s Head. Twelve Apostles Hotel is one of the most deluxe establishments in Cape Town, and with the majestic Twelve Apostles Mountain Range and the iconic Table Mountain on each side, it makes for a truly exceptional vantage point. The Atlantic Ocean stretches out before the hotel, adding a tranquil atmosphere to the surrounds. Cape Grace is a quaint boutique hotel situated between the busy Victoria & Alfred Waterfront and the international yacht marina. The stunning hotel offers a relaxing stay in close proximity to Cape Town’s busy city centre. 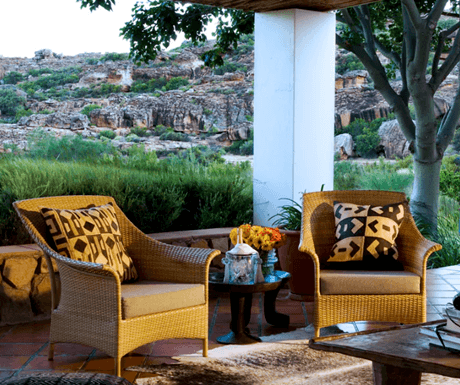 Set at the foot of the striking Cederberg Mountains, Bushmans Kloof is a peaceful nature retreat, perfect for those wanting to escape the busyness of city life. The retreat allows guests to become closer to nature, and the tranquil surrounds leave guests feeling relaxed and rejuvenated. The Table Bay Hotel is set in the shadow of Table Mountain, with an endless view of the ocean and Robben Island facing the rooms. Situated in close proximity to the Victoria & Alfred Waterfront, guests will be sure to experience the sparkling city lights as well as the calmness of the mountain and sea. Constantia Valley is picturesque and tranquil, promising any visitor a truly relaxing and memorable holiday. The Cellars-Hohenort is a luxurious country estate with a grand Manor House standing tall and proud amongst a gorgeous vineyard and lush gardens. Secluded, private and completely exclusive, Ellerman House is the perfect luxury retreat for those wishing to experience Africa in a different light. The world-class retreat offers fine dining, a marvellous cellar filled with 17’000 bottles of wine, and spectacular views over the ocean.